Send a state of instant tranquility with this miniature rose garden! The soothing pink blossoms and the beautiful dark green leaves will deliver a fresh sense of calm for a long time. 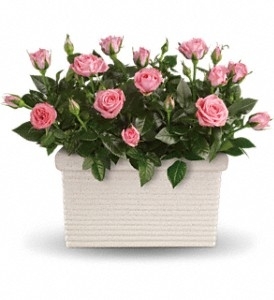 Two pretty pink miniature rose bushes are delivered in a white planter.